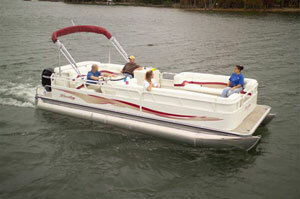 Let us take you on a leisurely cruise on beautiful Long Point Bay in the comfort of our 24' pontoon boat. Bring your family to Long Point to celebrate a special occasion, go fishing for Bass and Perch or bring a picnic and go swimming from the sandbar at Pottahawk Point. Our boat is kid- friendly, wheelchair accessible and equipped with an indoor washroom and change room. We can comfortably seat 8 adults if you are sight-seeing, or 6 for a fishing expedition. Whether fishing or sight-seeing, it’s always a great day on the bay! Reservations are required. $100.00 for every additional hour. NOTE: The boat is not a rental. Let us do the driving while you relax and enjoy your day!! !